After performing the disassembly (and possibly cleaning every part), you should have these parts ready for assembly. Insert the firing pin into the firing pin spring. 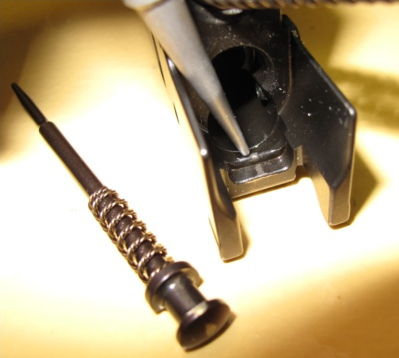 Then insert the firing pin and spring inside the bolt, ensuring that the the bolt grove points in one direction and the firing pin's flat end, points in the other direction. Insert the bolt in the bolt carrier assembly. 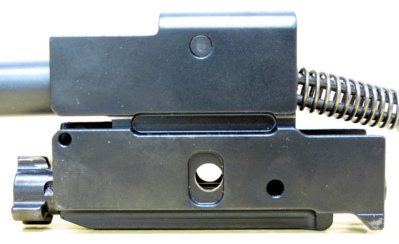 The firing pin will protrude at the back of the bolt carrier assembly. And now the fun part! Inserting the bolt guide pin. No 1. 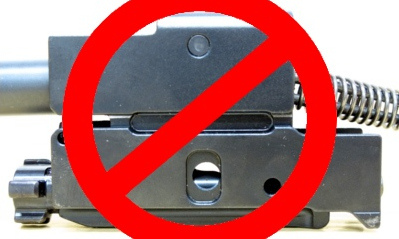 The firing pin must be pushed forward, rotated 180° and be properly placed in the bolt carrier sink. The ridge inside the bolt carrier assembly will stop the firing pin from being pushed out of the bolt carrier by the spring. When you rotate the firing pin, make sure that the ridge is between the too grooves at the back of it. No 2. The bolt groove must point up. If the bolt is rotated, the bolt guide pin will not fit! No 3. Then compress the bolt against the spring. No 4. The bolt guide pin can now be inserted. 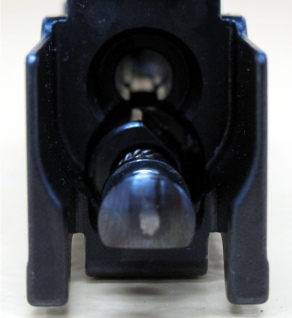 The flat side points towards the back of the bolt carrier. Push it in completly. 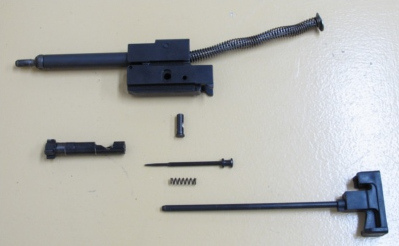 Insert the bolt carrier guide rod and attached buffer inside the bolt carrier assembly. 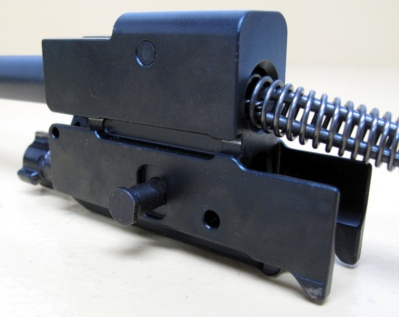 Compress the spring and insert the return spring guide in the buffer slot.